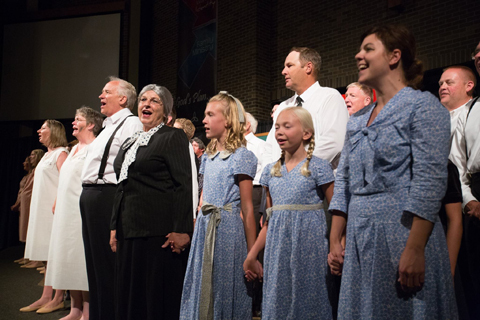 Ten Boom the Musical is based on the powerful true story of author and Holocaust survivor, Corrie ten Boom and her family. Their faith and courage to risk their very lives to hide more than 800 Jews, found them embroiled in intrigue during the WW2 Nazi occupation of Europe. 14 inspiring original songs bring the ten Boom family and other characters to life, telling of a “Perfect Love” that can bring hope and light, even in the worst darkness. The stage play is delightfully narrated by an aged “Corrie,” who tells her story with heart and her notorious good humor. The play begins with a dramatic, 90-second video newsreel of the times. Then a 100th Anniversary Celebration of the family watch business sees tensions mount, as the Nazi takeover of their beloved Haarlem, Holland home. Adapted from Corrie ten Boom’s best-selling book, written with Elizabeth and John Sherrill, The Hiding Place, “Ten Boom the Musical” is rich in memorable characters, flashbacks to gentler times, and heart-stirring music. ACT 2 begins with an orchestrated and choreographed Musical Tribute to Jewish composer Leo “Dutch” Smit, a Holocaust victim at Auschwitz, Germany in 1945. Act 2 scenes bring the ten Boom’s face-to-face with other prisoners and formidable characters. All of them are in need of hope and God’s love in the midst of harsh, sometimes deadly circumstances. And Corrie and sister Betsie’s “stubborn faith” brings that hope, even joy to many, including a hardened Nazi captain. See ACTOR’S SCRIPT for full ACT 1 and Act 2 Synopses.